Reports are trickling in, chatter is growing louder in the corners of local fly shops, and pullouts are being used more by anglers than for excess snow. Don’t put your skis or boards away yet—some of the best snow of the season will soon fall on the slopes. But if you take your recreation seriously, have your waders and rod at the ready at all times because we are in the season of potential. Conditions during the next six weeks are what dreams are made of in our mountain hamlet. Try saying “tram laps and midge hatches” five times fast. Not so hard is it? Neither is getting them into your daily routine. It all starts with longer days. By the first few days of February the morning light in Gallatin Canyon is brighter, and the evening sunset lingers. These extra few hours of daylight result in more active insect life, which results in more actively feeding fish, which results in legitimate dry fly fishing opportunities. But before you clear your calendar and raise your expectations, a dose of reality is encouraged. It’s still winter out there, so plan your outing appropriately. The fishing is going to be best midday and during the afternoon. If the wind is blowing more than 10-15 mph it’s going to feel cold. Have proper gear and fish safely. 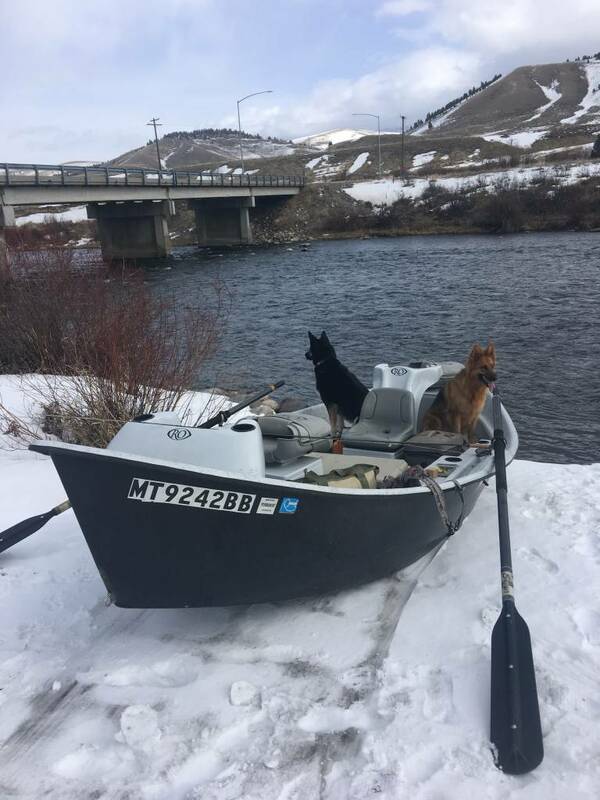 If it’s your first time fly fishing in winter consider hiring a guide. If you’re OK with all of this, then make sure you understand winter’s dry-fly opportunities are all about potential, not always reality. Embrace the midge. Midge is the common name given to a large class of insects on which trout feed. Similar to caddis, a hatching midge rises through the water column to eventually hang just under the surface—easy pickings for trout. When a midge is ready to hatch, or emerge, the insect releases gasses and attempts to free themselves from their pupal shuck. This struggle attracts feeding and rising trout for the attuned angler. Visit your optician. Or visit your local fly shop and buy a pair of reading glasses. Midges are tiny—size 18 flies are the norm, yet size 22s are common and the ability to tie 5X tippet onto a size 20 is essential. If you cringe at these numbers, magnifiers are game changers, like indoor plumbing or automatic transmissions. Two flies are better than one. If you observe fish feeding on the surface, consider fishing two flies. Because midges are so small, fish a high-floating dry-fly midge imitation, either a Buzzball or a Griffith’s Gnat in sizes 18 or 20. From the bend of the hook on the dry fly tie an emerging midge pattern one size smaller than your dry fly. My favorite patterns are RS2s and CDC midge emergers, with the Wondernymph being my favorite. Your tippet is crucial. With smaller flies comes a bigger reliance on specialized tippet material. Never use fluorocarbon for fishing tiny dry flies or emergers. Flurocarbon sinks, causing your dry flies to drag unnaturally in the water. I fish Rio Suppleflex tippet exclusively and apply a liquid floatant and powder desiccant to the fly. The liquid floatant doesn’t goop-up the tiny dry flies, while the desiccant dries and dusts the fly in a hint of white powder, making it easier to detect. Griffith’s gnat – This fly mimics a midge cluster on any river. The pattern is effective on the Gallatin and Upper Madison, but it should work on any body of water where midge clusters dominate in winter. Jujubee midge – Created by fly-tying legend Charlie Craven, and inspired by the ultra-selective trout on pressured waters, this has become a local favorite. Similar to a Zebra midge, they can be fished as a deep nymph or emerging insect. Once you go Juju you’ll catch trout through and through. Tiny Buzzball – A variation of Gary LaFontaine’s original caddis pattern, this fly floats high and can float an emerger pattern off its hook. When midge hatches are prolific, adult midges will form groups, or clusters—LaFontaine’s Buzzball is a time-tested fly for micro dry-dropper situations. Potential is at the core of why many of us go fishing. It’s the potential to get the big one that got away last time—or the potential to get away from the office, the hashtags and the updates. For anglers in the know, this time of year can be the beginning of unexpectedly good dry-fly fishing. Yet this new reality doesn’t come easy—fishing midge dry flies is challenging. But if it were easy, it’d be called nymphing.